The Local Government, Tourism and Cultural Affairs Minister, Punjab, Mr. Navjot Singh Sidhu here today inaugurated the ‘World Food Festival’ and ‘Traditional Rasoi Sammelan’ and invited all the world famous chefs to open an Indian Culinary Institute in Punjab so as to give fillip to the hotel as well as the tourism sector in the state. The minister also assured that the State Government would extend all possible assistance for the purpose apart from providing land.The minister further said that at present the young generation is migrating to the foreign shores by spending over Rs. 30 lakhs each leading to not only money drain but brain drain too. He said that if such an institute comes up at either Amritsar or Mohali then it would pave the way for skill education for the youth thereby not only generating job avenues but would also result in the foreign students coming to India for study.On the occasion, Mr. Sidhu while announcing the last installment of Rs. 15 crore for the renovation and beautification of the Gobindgarh Fort, said that such buildings are the symbol of great cultural heritage of Punjab and it is our duty to ensure that they are perfectly maintained. He also said that a tender worth Rs. 10.76 crore has been issued at townhall for the purpose of building an International Food Street which would commence the operations by 31st March, 2020. Divulging more, the minister said that the street would have 16 food courts, 2 huge restaurants, Cafeteria, 5 art and craft shops, Exhibition hall and the Conference room. 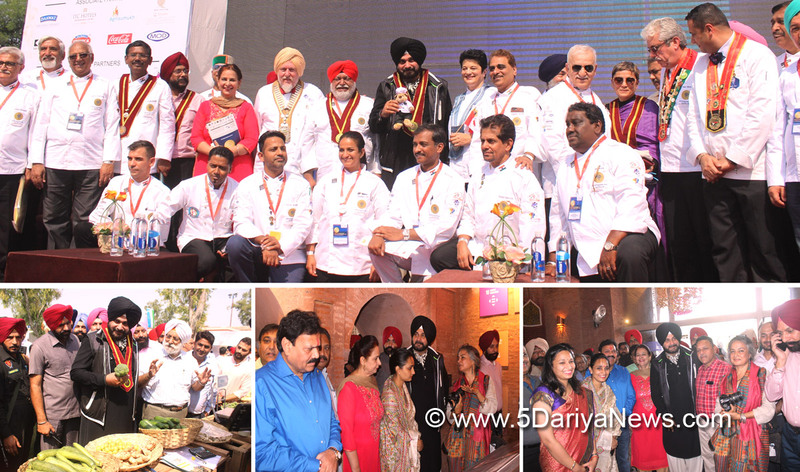 Appreciating the selection of Amritsar as the venue by the World Culture Culinary Heritage Committee for food festival, Mr. Sidhu said that in today’s scenario, the food is not just limited to taste and eating purposes but it has assumed the shape of a big industry today which provides employment to scores of people. The Chairman of the World Chef Association Mr. Thomas Guggler on the occasion said that such occasions are an attempt to preserve the traditional cuisines and culinary culture and the Indian food holds a place of pride amongst the world cuisines.Eminent Chef Mr. Manjit Gill on the occasion thanked the District Administration and the Punjab Government for extending whole hearted cooperation for the food festival and also said thanked the Deputy Commissioner Mr. Kamaldeep Singh Sangha for providing every help. Among others present included Mrs. Navjot Kaur Sidhu, Secretary Tourism and Cultural Affairs Department Mr. Vikas Pratap, DC Mr. Kamaldeep Singh Sangha, Commissioner of Police Mr. S. Srivastava, Director Tourism & Cultural Affairs Department, Punjab, Mr. Malwinder Singh Jaggi, Mrs. Deepa Sahi, Director of the Food Festival Mr. Harby Sidhu and Managing Director Mr. Meridd.